Rectory Cottage in Blankney, near Lincoln sleeps 4 people. Rectory Cottage near Lincoln is a detached cottage which stands in the grounds of Blankney’s former rectory. Rectory Cottage has a secluded position within its own enclosed garden. The hot tub is perfect for relaxing in after a day exploring nearby Lincoln, famous for its magnificent cathedral, castle and the Magna Carta Visitors Centre. Visit the Bailgate area in the heart of Lincoln’s historic quarter and discover a world of specialist shops including boutiques, crafts, book and gift shops, not to mention tea rooms and restaurants that line the cobbled streets. The neighbouring village, with its pub and restaurant is just 1½ miles away, and Blankney Golf Club, an 18-hole golf course, is under ½ mile. Rectory Cottage has been renovated to a high standard of comfort, with two bathrooms on the first floor, one of which is en-suite. 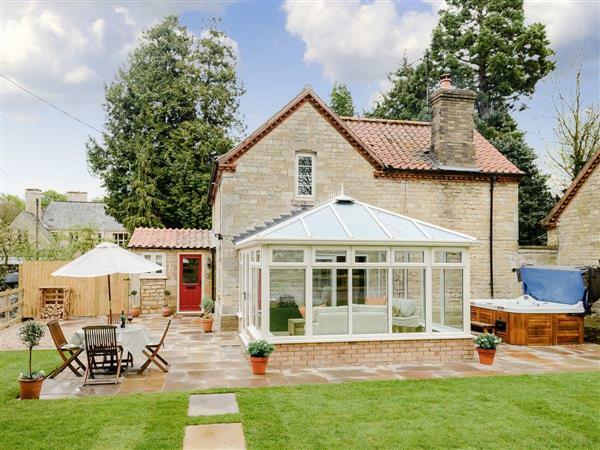 Relax in front of the cosy wood burner with a good book, or enjoy the view of the mature garden from the conservatory - there is plenty of space for everyone. A network of footpaths, offering country walks, is easily accessible and the area offers great cycle routes. The shops and pub/restaurants are 1½ miles from Rectory Cottage near Lincoln. Bedroom 1: With king-size bed, Freeview TV and en-suite with bath, shower cubicle, toilet and heated towel rail. Oil central heating, electricity, bed linen, towels, Wi-Fi and logs for wood burner included. Travel cot, highchair and stairgate available on request. Welcome pack. Enclosed lawned garden with sitting-out area, garden furniture and barbecue. Hot tub for 4 (private). Private parking for 4 cars. No smoking. Holidays at Rectory Cottage run from Friday to Friday. Pets allowed at Rectory Cottage. For a better idea of where Rectory Cottage is, you can see Rectory Cottage on the map below. Rectory Cottage is in Lincolnshire; should you be on the lookout for a special offer, you can find all the special offers in Lincolnshire. It's always worth checking to see what is on offer at the moment. Do you want to holiday near Rectory Cottage (UKC1259), you can see other cottages within 25 miles of Rectory Cottage; have a look to find your perfect holiday location.